Built by New York Shipbuilding Corporation in Camden, NJ. Laid down as a design 1095 ship as hull 249 for the United States Shipping Board (USSB) . Launched December 1920 as Centennial State with a crew of 117. Completed May 1921. During June 1921 maiden voyage from New York to London for the U. S. Mail Line. During August 1921 the company was liquidated and this ship was sold to the United States Line. In May 1922, the ship was renamed President Adams. Afterwards, sold to Dollar Steamship Company (Dollar Line). Grounded near the eastern edge of the Panama Canal but freed sucessfully and repaired at San Francisco. In 1938 the U. S. government purchased the management of the Dollar Steamship Company and transferred their assets to the American President Line (APL) that operated a trans-Pacific and around the world service. In 1939, all APL ships was pressed into U. S. Navy (USN) service with a wartime crew of 140+ men. Renamed President Grant. Voyage 57: On November 9, 1941 departed San Francisco under the command of Captain W. S. Tyrrell traveling via Honolulu then to Manila Bay arriving December 6, 1941. On December 8, 1941 Japanese aircraft bombed Manila and the ship was attacked. On December 11, 1941 evacuated the Philippines without all the crew aboard southward to Darwin. After the Japanese occupied Manila, the stranded crew members were interned by the Japanese in POW camps and two died in captivity. Post war, the survivors attempted to sue the APL for allegedly leaving knowing they were ashore. During the trip to Australia, the ship's white paint was over painted with gray over four days and arrived December 19, 1941 at Darwin. On December 23, 1941 departed evacuating 225 women and children transporting them to Brisbane eight days later. On January 2, 1942 departed for San Pedro where she was converted into a troop transport capable of carrying 1,776 personnel with the installation of bunk beds, extra latrines, life rafts and ballast. Armed with deck guns and anti-aircraft guns including 20mm cannons around the bridge, on the aft part of the superstructure and between the two after masts. On February 20, 1943 departed with a crew of 140 plus attached U. S. Marines. Voyage 62: On July 21, 1942 the President Grant departed with troops aboard, arriving at Noumea on August 10, 1942. Survivors of the HMAS Canberra rescued by the USS Patterson after the Battle of Savo Island were transferred aboard the President Grant then transported to Sydney. Voyage 63: Departing San Francisco on October 1, 1942 and dropping off troops at Auckland. Then, to Noumea and Honolulu. Transported Marines to Fiji, and transport of troops from Suva and Noumea to Guadalcanal, Tulagi and Espiritu Santo, returning to port on January 31, 1943 without incident. Voyage 64: Departed for Port Moresby via Sydney then returning to San Francisco on May 7, 1943. Captain Harry Nelson (formally captain of SS President Coolidge when the ship struck a mine at Espiritu Santo) took command of the ship for the next two voyages. Voyage 65 and Voyage 66 were trips from Brisbane and Townsville. Voyage 67: Arrived at Brisbane on December 30, 1943, and 120 RAAF trainee airmen boarded for Canada. During this voyage there was a galley fire and the engines stopped for thirty minutes at sea, while an oil cap was repaired. Voyage 68: The ship had made twenty-three Pacific trips to day. On February 2, 1944 A new captain, Joseph D. Ryan departed San Francisco with 1,600 troops aboard departed for Milne Bay. 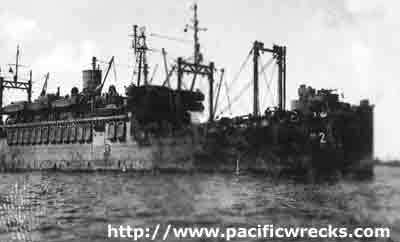 On February 26, 1944 at 5:10am while traveling at 13 knots ran aground on Uluma Reef (Suckling Reef) to the southeast of Milne Bay at roughly Lat 11° 7′ 0″ S Long 150° 58′ 0″ E. The bow was at 10' draft instead of 20'. The forward hull was damaged, but propellers and rudder undamaged. After the grounding, a 112 day salvage effort was undertaken by Allied vessels in an attempt to save the ship. On February 27, 1944 HMAS Gascoyne was dispatched to render assistance, but could not attach a tow line, for fear of becoming grounded as well. HMAS Gascoyne and USS Sub Chaser PC1121 patrolled for subs (relieved on February 29 by HMAS Geelong and PC 476), while tugs and salvage experts from Milne Bay included HMAS Reserve and USS Sonoma and attempted to unsuccessfully tow the grounded ship off the reef. After off-loading the troops to the tugs and LCM to the US Liberty Ship, Dunhan Wright and John T. Rossiter, which departed for Milne Bay. Divers from the submarine tender, USS Fulton inspected the damage. On February 28, 1944 salvage ship Caledonian Salvor arrived to assist but operations were hampered by deteriorating weather condition. 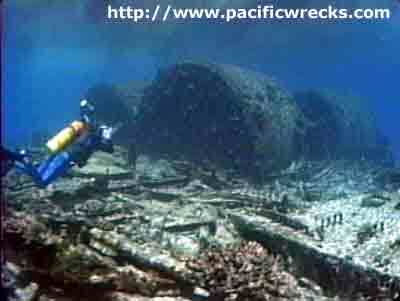 On March 1, 1944 a storm pushed the ship further onto the reef. Gale winds halted work between March 2, 1944 until March 8, 1944 and more crew were taken off the ship. On March 8, 1944, Marines prematurely attempted to launch a lifeboat was launched and hit several members of the salvage crew, and killing a SSgt J. J. Byrnes, and several were wounded, one later died. Loos cargo was removed from the ship, including removing ballast and 900 tons of concrete block ballast from the holds. An attempt was made to rotate the ship , but weather interfered, causing more damage to the ship before another attempt could be made on March 26, 1944 with four tugs: Arkansas Pass, Reserve, Sonoma and Chetco. The rotation was not achieved until June 9, 1944 but the midship was still stuck on the reef and weather turned bad. A final attempt was made to flood hold no. 3 and no. 4, but the weather deteriorated more. The weather caused the ground lines to snap, and the bow swung back onto the original grounding position on the reef, and was pounded by heavy seas and sustained more damage, and a wave snapped the ship in too, and flooding extinguished the furnaces and the ship was further damaged on the reef. The next morning, heavy damage was observed on the ship. the 100 day salvage attempt had failed. On June 2, 1944 the ship was declared a total loss, but cyclone strength winds of 90 knots prevented the rescue of the ship's remaining crew and salvage gear until June 15, concluding the 112 day salvage effort, and the ship was abandoned at June 17, 1944. A maritime inquiry convened on July 10, 1944 and the ship's loss was declared accidental and no charges filed. 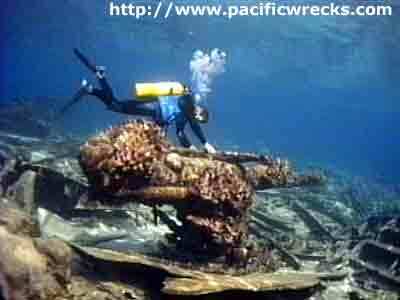 In late 1969, salvager Fritz Herscheid purchased the wreck and salvaged the wreck until June 1970. During that period, they removed non-ferrous metal, the propellers, 50 caliber ammunition and 6" shells from the wreck and area with his dive team and the help of locals. Returning in late 1970, Herscheid and his team of salvagers recovered more scrap, and removing the ship's 2.5 ton propellers. Among the wreck, they discovered four strands of 3" thick pure copper wire which appeared to encircle the entire ship, possibly for magnetic mine deguassing. Usually, it is diveable a few days a year according to Robert Halstead. Other times, large swells make dives difficult. "The President Grant a liberty ship that had run up on Ulma Reef and broken up over the years. Ulma Reef is located SE of Milne Bay. Visibility was in excess of 200 feet and the sea was glass flat with no wind for two days of fantastic diving on the wreck and drift diving along Ulma Reef. 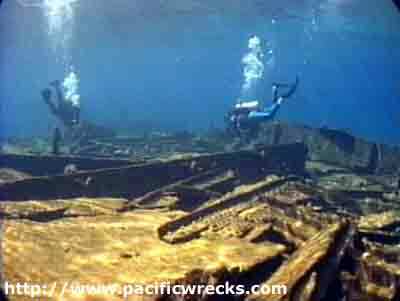 We were the first recreational divers on the wreck and the first to visit the site in 15 years according to Robert Halstead. We were forced south due to poor visibility caused by volcanic action stirring up the sea bed, just happened that the seas were calm and vis was at least 200' at Ulma. There are very few people around who can say they have dived the President Grant."